Today was the day I saw another counsellor, a different one this time, a woman who seemed perfectly nice. I am just not sure the whole counselling thing is "for me." I came out more frustrated than I went in. She told me that I need to "find some hope," What the hell does that even mean?! Find some hope? How do you even do that? The thing is I was a extremely 'hopeful' 21 year old when I was put on the list way back in 2012, I was living in a idealistic world of "I'll get my transplant soon" "There's no way I won't get my transplant." The problem now is it's 3 years this coming Monday that I was put on the list, in those 3 years I've seen transplant friends die having got their transplants, I've seen transplant friends die waiting for their transplants, I've seen PH friends die before even making it onto the list and I've seen other friends who are just too ill to even get on the list, that alone does not inspire or promote "Hope" in anyway, yet I still remained hopeful because I am ME, I know me and I know I can do this. 3 years though guys, honestly unless you have waited 3 years for a transplant you just have no idea the strain it puts on you. My hope is being chipped at and I don't think I can just find more and I'm not even sure just talking about things is going to help because what I'm saying is not irrational, it's not wrong what I'm thinking and there's no way to change the situation, so how do you help in that kind of situation? You can't just go and pick a different life from the supermarket, you can't just pick up a bit of hope on your way down the vegetable isle. So how do you find it? How do you change your mindset when everything you are thinking is completely right and completely rational. I honestly have no idea. The thing is I pretend I'm okay because I feel like I have to, I know people tell me I don't have to but that doesn't make the feeling go away. There are people who look to me and I have to be okay with what is happening to me because they need to see that you can do it, you can wait this long and you can still get your transplant without completely losing your marbles in the process but there are days when I just want to throw in the towel and hide away from the world, but I can't because this is my life and as hard as I'm currently finding it mentally tomorrow will still come and I have to make it through that day. I am extremely lucky that I have many friends who understand to an extent what I'm going through without pretending like they can totally get it and they help me a lot I'm pretty sure they are better than any counsellors of psychologists will ever be. I just wonder where does everybody else get their hope from? Religion, people, what?! I just don't know how to get more hope am I doing something wrong? Is this something easily acquired and I'm just not getting it? I'm going to try another counsellor/psychologist at least. I rang Papworth and they said they are going to try and arrange me to see one who deals more with transplant patients and maybe that will help, I don't know. Literally one of the hardest things I have ever had to read from you Stacie. I really hope you can find some hope somewhere amongst you. It must be so hard to watch others around you struggle & not make it, it doesn't give you much hope though :\ urgh. I hope you'll see somebody else who helps boost your mood just a little. There's an old Russian saying, 'Hope dies last' - where even in their coldest winter they would stay tough and fight on till the bitter end. 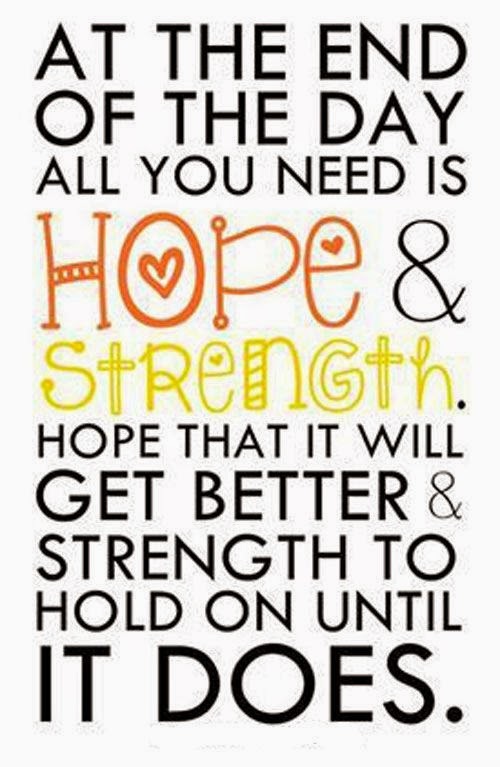 So personally, I think telling you to 'find hope' is a bit hard, because you're incredibly tough! And I hope another counsellor can help!